A Letter to Momo (Momo e no tegami) is an award-winning Japanese anime drama film from 2011 that is so exquisitely detailed, it was seven years in the making. After the death of her father, an 11-year-old girl named Momo Miyaura and her mother Ikuko travel from Tokyo to the remote Japanese island of Shio in the Seto Inland Sea. Momo has a hard time coping with her father’s death, because the last time she saw him they had a fight – and now all she has left to remember him by is an unfinished letter on which he had written the words “Dear Momo” but nothing more. 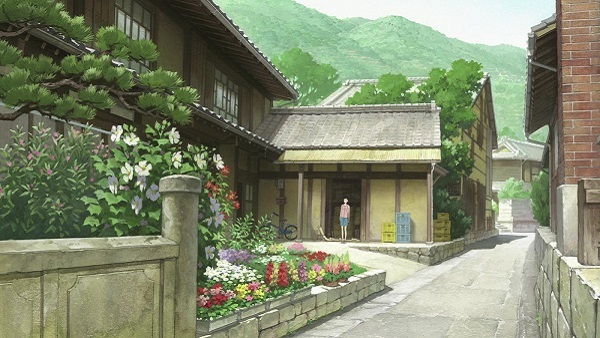 As they get settled in their new house in Ikuko’s old hometown, Momo and her mother meet relatives Sachio and Sae Sadahama as well as Koichi, a local postman. Momo receives a present containing a rare picture book about Yōkai (“monsters”), which was collected by Sachio’s father. Around the same time, three water droplets fall from the sky and transform into three yokai. Ikuko enrolls in nursing classes, leaving Momo free to explore the town and countryside. She meets some local children including a boy named Yota and his sister Umi. But strange things soon start happening on the island. Orchards are ransacked, prized trinkets disappear, and Momo hears strange sounds coming from the attic of their new home. Annoyed by these mysterious happenings and her mother’s refusal to believe them, Momo embarks on an adventure to find the source of the mischief. One rainy day she discovers a trio of troublesome but friendly imps that only she can see. Momo also learns that their appearance is in some way connected to her father’s letter and may hold the key to helping Momo learn what her father had been trying to tell her. The hand-drawn animation in A Letter to Momo is superb, fro m the painstakingly rendered serenity of the island’s Shinto shrines to the climactic chase scene featuring thousands of squirming, morphing ghosts and spirits that is a cinematic flight of supernatural fancy rivaling anything Studio Ghibli has ever produced. A Letter to Momo broaches the topic of the loss of a loved one with sensitivity and understanding. Momo’s conflicting emotions and childlike curiosity are realistically portrayed. The three odd-looking goblins provide a touch of fantasy and comedic relief while bridging the gap between the human world and the spiritual world. Watch A Letter to Momo free on Amazon Prime or buy the DVD . How come umi can see the imps too? It didn’t really say, but I think it’s because she’s a little kid and they tend to be more perceptive, open-minded, and sensitive to spirits. Just like young children have a natural sense of wonder that many people lose as they get older.